Sailor Moon Crystal Season 3 (apparently named by the same person who thought “Super Smash Bros. for Wii U” was a good idea and not awkward at all) is vaguely parallel to Sailor Moon S, the third season of the original 90's anime. Both are based on the Infinity Arc from the manga, which introduces the remaining Outer Senshi, Uranus, Neptune and Saturn. Season 3 of Crystal is shaping up to be a faithful adaption of the manga, just like seasons 1 and 2. On top of that, almost all of the staff from the earlier seasons are still working on season 3. After watching the first episode a couple times now, I can conclude the following: 1) the Crystal detractors are MUCH happier with it now, 2) it’s still based heavily on the manga, and 3) Toei absolutely listened to feedback. Why the celebration among the fans, including so many people who despised Crystal? Well, S3 reflects a SIGNIFICANT improvement in presentation. First, instead of being broadcast online on Nico Nico, it’s being broadcast on TV, and the difference in quality is unmistakable. It’s like all those problems that sprung from S1 and S2 being a low-budget show were fixed by........... giving the team more money. Imagine that! The biggest triumph by far is the character designs. Now, I’ve gone on record saying I liked the previous Crystal designs (and, overall, Crystal itself), but there’s no denying that a lot of people did not like the character designs in Crystal. In season 3, we’ve got new character designs by Akira Takahashi, who not only worked on Sailor Moon Sailor Stars back in the 90's, but is the long-time character designer for Precure and worked as animation director for several individual episodes of S1/S2 of Crystal. He’s definitely someone “in the know”, not just for Sailor Moon, but for the genre itself. These designs are brilliant. On first glance, they didn’t feel all that different to me from the old designs. The eyes in particular look much rounder and more conventional, especially Chibiusa, who had more squarish, angular eyes in S1/S2. “More conventional” is how I’d describe the designs in general, to be honest, but before Monday I would have told you that they didn’t look that different from the first two seasons. But if you look at the before and after next to each other, the difference is pretty staggering. Just going off the comparisons above, the background for Sailor Venus’ introduction was much better in the old version. The lighting and shadows, too, look better in the old version. But pretty much everything else looks better in the newer renditions. The proportions of their heads in particular is much, much better. Look at Venus’ hand and arm in the top image, and them compare it to the bottom one. YIKES. For me, the fact that I can’t tell exactly how different they are without directly comparing them, is a huge triumph. It both fixes the perceived wonkyness of the old designs while keeping some of the manga-inspired look and feel. I’m completely and utterly satisfied by them, and I know that many disillusioned Moonies are on board with season 3 just from the redone character designs alone. The difference in direction is also noticeable just from one episode. Chiaki Kon, one of the few successful female anime directors ever, was brought on board for season 3 in an apparent desire to address some of the fans’ complaints. Kon has previously worked on Midori Days, Bleach, Higurashi no Naku Koro ni, and Hetalia, along with other maybe more obscure projects, including adaptions of BL manga and light novels. In other words, she’s got experience working on series aimed at both men and women, and it’s wonderful that a woman is directing the reboot of the most important shoujo series ever made. Just in this first episode, there’s a number of directorial changes that make for a more fun, energetic episode compared to Crystal. In response to fan backlash, and apparently also upon request by series creator Naoko Takeuchi, there’s more silly, lighthearted moments, including the goofy exaggerated facial expressions that the 90's anime was known for. This is a big bonus for me, because even Takeuchi’s manga had tons of silliness and over-the-top anime slapstick; its absence from S1/S2 was one of the few ways it had departed from the manga. And 90's anime fans, or more casual fans who are mostly familiar with the old anime, are certain to enjoy the arrival of more humor to the show. Finally, I’ve heard that Kon agreed to direct season 3 of Crystal on the condition that the transformation sequences be hand-animated again, instead of CGI. (A video of them is below!) Which is just... hilarious. I probably would have said the same thing. Anyway, if that’s true, we have her to thank for the AMAZINGLY beautiful hand-done transformation sequences in S3. Anyway, what actually happens in this episode? I’ll do a quick review, but nothing nearly as lengthy as my recent Sailor Stars articles. Obviously, there will be spoilers here for those who have not watched the new episode yet. You can find it on Crunchyroll, Hulu, Viz.com and Neon Alley! The episode opens with some monologuing by this season’s new set of villains, the Death Busters. As a manga nerd, it was really exciting to hear Pharaoh 90 talking about a bunch of manga-only plot points like the Taioron Crystal. Then we get a brief sequence where Hotaru is dreaming about the Sailor Senshi before it cuts to the OP, “New Moon Ni Koi Shite.” Video below! This OP is....... okay. I really like the opening part of it, and the animation is great, but it just doesn’t have the energy and power I want from a Sailor Moon opening. The singer almost sounds bored and uninterested, or afraid to raise her voice higher than a half-whisper. Like, her performance is way too cutesy and delicate. It’s just not a song that gets me PUMPED to watch Sailor Moon the way Moon Pride, Sailor Star Song or Moonlight Densetsu does. It’ll probably grow on me, but for now, it’s a meh. Anyway, the episode proper opens with both Hotaru and Mamoru waking up from a prophetic dream. I really love how Crystal has been careful to show Mamoru’s psychic-like powers that he has in the manga, along with just treating him better in general. At Hikawa Shrine, Rei is meditating in front of a fire and senses something evil as well. Usagi is also dreaming......... about her future wedding. When she wakes up, she’s late for school already, as usual. Chibiusa teases Usagi, but she’s interrupted by a creepy news broadcast about someone experiencing “reversion,” a phenomenon where humans transform back into a primal, ape-like state. The monster on the TV is...... not even remotely similar to an ape or monkey......... but sure, let’s go with that. In some shots, the characters still strongly resemble the old designs. Usagi in particular looks very similar to me here. But again, if I compared it to a shot from the previous seasons, would that impression be disproved? No idea. Chibiusa follows Usagi out to the park where she’s meeting Mamoru, crashing a romantic moment. The Core Trio looks great and gets across the right familial bond in this scene. Chibiusa runs off to school, leaving Usagi and Mamoru to finally kiss each other goodbye in peace. But Mamoru gets a weird vision again, and Usagi watches him walk off with a similar feeling of anxiety. They’re enjoying peace right now, but if more enemies come, she’s prepared to fight them, because that’s her destiny. Yeah girl!! You can do it! By the way, so far, this is almost 1:1 identical with the panels, beats and dialogue of the manga, including Usagi’s internal pep talk to herself. It then cuts to our very first shot of Michiru, taking a swim. Her helicopter, Kaiohmaru - yes, she’s a 16 year old with a goddamn helicopter, and yes, she named it - is waiting outside for her, apparently capable of understanding human speech. Elsewhere, Haruka - looking intentionally more masculine, in-line with how Takeuchi drew her more boyish before the reveal of her real gender - is being marveled at down at the race track. And she’s got a named helicopter too, of course. Have I mentioned how much I love these two? They’re just so over-the-top cool, ESPECIALLY in the manga. Even the girls at their school can’t deal with how COOL they are. Next we’re at Crown Arcade, and we meet season 3's rendition of the Inner Senshi. Each of them spout a line and get a little introduction before we move on. It’s not a lot of characterization, but apparently these brief one-liners really made people happy, with some ready to declare that season 3 has “more characterization” than last season. Methinks there’s a little bit of unfair selective memory going on with that (almost all of this “more characterization” is directly from the manga and not that different from the characterization in the last two seasons) and those folks are being too quick to draw such a conclusion anyway from just the first episode. But hey, if we can all finally be happy with Crystal together, I’m happy! And at any rate, Kon’s direction and the more expressive animation is what makes the girls come to life in such a short amount of time, in a way S1/S2 wasn’t able to pull off. Anyway, the girls sit down to play a new racing game and meet Haruka in the process, who thrashes them all at the game because she’s such a good real-life race car driver. Usagi has a blushy moment with Haruka, and outside on the street, Mamoru and Michiru happen to bump into each other and share a similarly mysterious moment. 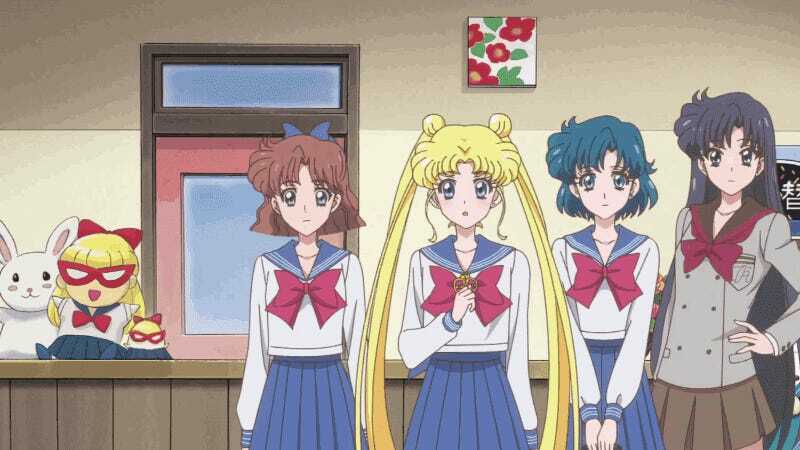 Anyway, the girls realize that Haruka and Michiru’s school uniforms are from Mugen Academy, a new school that’s famously attended by child prodigies. Michiru is a prodigy violinist, and Haruka is a prodigy racer. Some more students from Mugen walk by, and suddenly Usagi’s brooch starts to glow. Immediately after, one of the Mugen students suddenly transforms into some kind of horrible Eldritch monster. Mmmghhh, as a manga fan I am SO HAPPY to see the Infinity Arc’s hideous body horror monsters come to life. Sailor Moon S went in a completely different direction, fashioning the Daimons off objects to give us, uh, vacuum cleaner monsters, and sneaker monsters, and snowman monsters. Of course they were all hilarious and memorable, but if you want another example of something manga-lovers wanted to see animated, legit terrifying Daimons is one of them. With a monster on the loose and threatening innocent bystanders, the girls have to transform. And then... AND THEN! THE NEW 2D TRANSFORMATIONS. I’m sorry, I need a minute. I’m just so, so happy. It looks so great. It’s so much better. No more CG. No more noodly fingers. No more Gumby hair. They’re all perfect. It’s okay for me to like Crystal now. IT’S OKAY NOW! Sailor Mercury analyzes the enemy and tells everyone that the student it transformed from is still alive and trapped inside the monster. Sailor Mars tries to throw some talismans on it, but they don’t work. Looks like it isn’t any kind of evil spirit. So instead, Jupiter and Venus bust out some awesome new attacks against it, which are impressively animated, and they defeat the monster and see a creepy dark orb leave the girl. It’s not much, but even then, this episode probably has better action than any other episode of Crystal before it. Down at their base beneath Crown, Luna and Artemis have confirmed that the monster is an example of “reversion,” or at least the same kind of “reversion” mentioned that morning on the news. Considering that the victim was a student of Mugen Academy, they decide to investigate the school as their first lead... in the next episode. Nooooo, it’s over way to soon! At least we get to listen to the ending song - the consensus seems to be that it’s fantastic. HOLY CRAP, THIS IS AWESOME. Why isn’t THIS the OP? I love everything about this. Even its silly Engrish name, “Eternal Eternity.” 10 lesbian cousins out of 10. So, overall, this was a very promising episode. It followed the story of the manga extremely faithfully, but it also took the time to include a handful more character-focused moments. For example, Makoto and Minako’s fangirling is in the manga, but it’s only a few panels; it’s greatly expanded on in this episode to wonderful effect. Which is exactly what people wanted Crystal to do in the first place! Manga story, but adapted for the screen. Not changing what made the manga so beloved, but improving on its flaws like pacing and characterization. The 90's anime’s tone and sense of fun, but without the 90's anime’s dumbed-down plot that threw away all of Takeuchi’s best ideas. I enjoyed and defended Sailor Moon Crystal’s first two arcs, and even I am enthusiastically happy with just how much they listened to people’s complaints. If you’re someone who didn’t like Crystal, or even despised it, I can’t imagine just how satisfied you probably are with this episode. But I’d like to end this article on one final, sobering note: even though I just said all that, none of us should get our hopes up too high yet. So sure, this episode expands on the characterization in the parallel manga chapter a little bit, and it’s got pretty good animation, and there’s a promise of more humor. But don’t take any of this for granted as we’re going forward. Crystal has a lot of ground to make up after failing to deliver on its hype in S1 and S2. Whether the nostalgia-fueled fanbase will be happy with what season 3 ultimately delivers is still to be seen. But, I really hope it does. I want my long-time fandom to be at peace again. So, what did you think of the first episode, AniTAY? Love it, hate it? Special observations? Discuss! You can follow the author on Twitter at @sub_judice. Thanks to Unimplied for gif help!